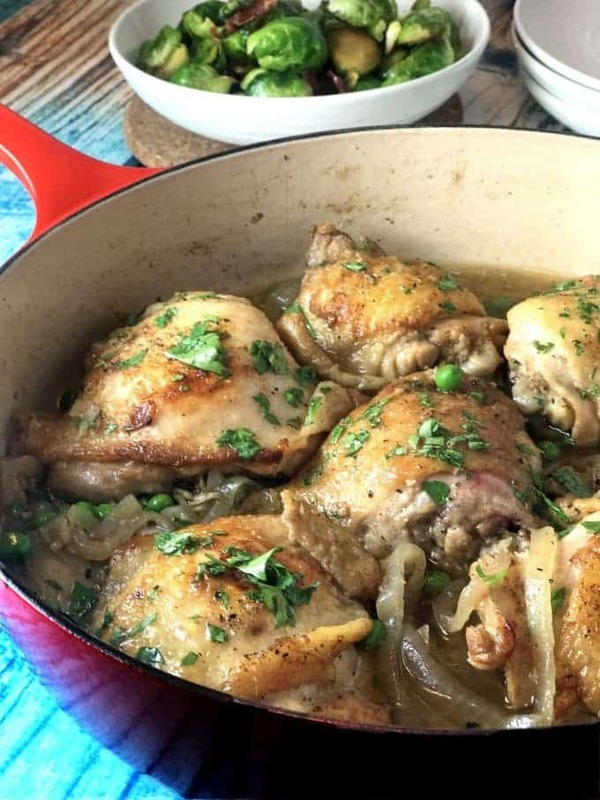 This Whiskey Chicken Recipe with Bourbon and Garlic goes together in about 30 minutes. 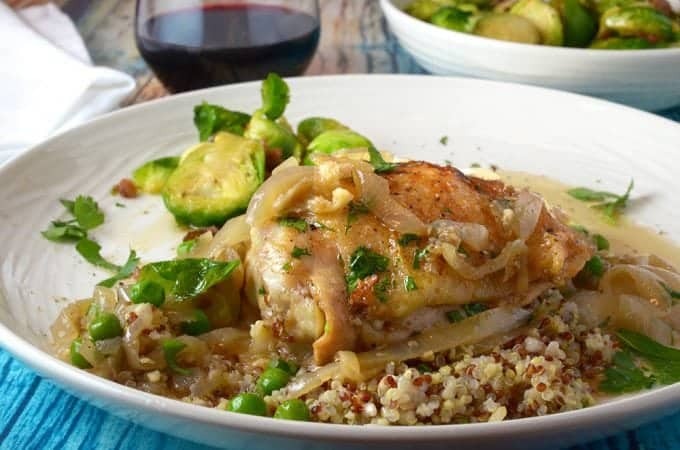 It’s fast and easy to make and full of flavor, making it ideal for a weeknight meal or perfect for when you are expecting guests. 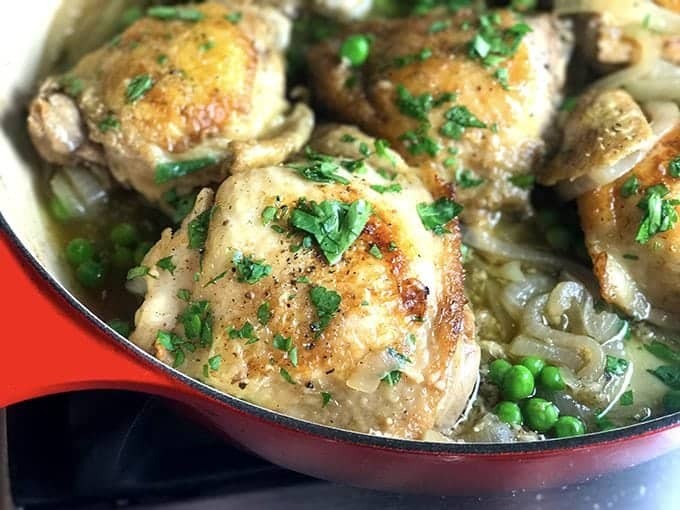 There’s no reason you can’t use any parts of the chicken for this whiskey chicken recipe but by using just thighs you end up with uniform portions and can expect all of the pieces to be done at about the same time. Many people prefer the dark meat from the chicken thigh because of its deeper flavor and I happen to be one of those folks. Although this is not an affiliate endorsement, this photo was taken with my new iPhone 7 plus. I suppose that there was some good that came out of accidentally shattering the screen of my four year old iPhone 5, although it didn’t seem like such a great situation at the time. 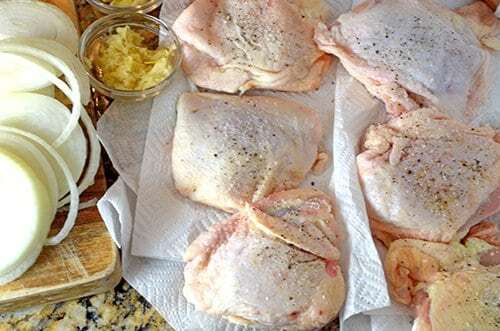 Start by using some paper towels to pat the chicken dry and then season with salt and pepper. Drying the thighs first will help to get a crisper finish on the sear. Next, give the thighs a nice sear in a hot skillet, using butter and olive oil. Sautée a sliced onion and handful of crushed garlic cloves. Add bourbon and chicken broth to the pot and simmer for a bit. Finally, return chicken to skillet and cook, skin side up, for about 20 more minutes. 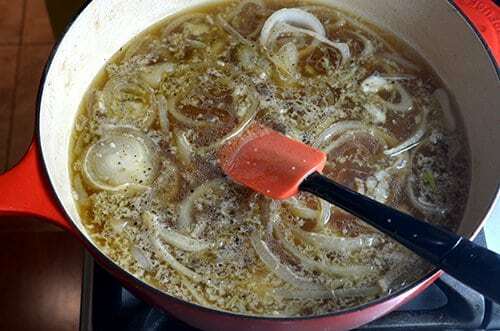 During the cooking process, the broth will reduce and thicken up a bit, making for a velvety sauce. Frozen green peas and a simple garnish of chopped parsley are added, just before serving. 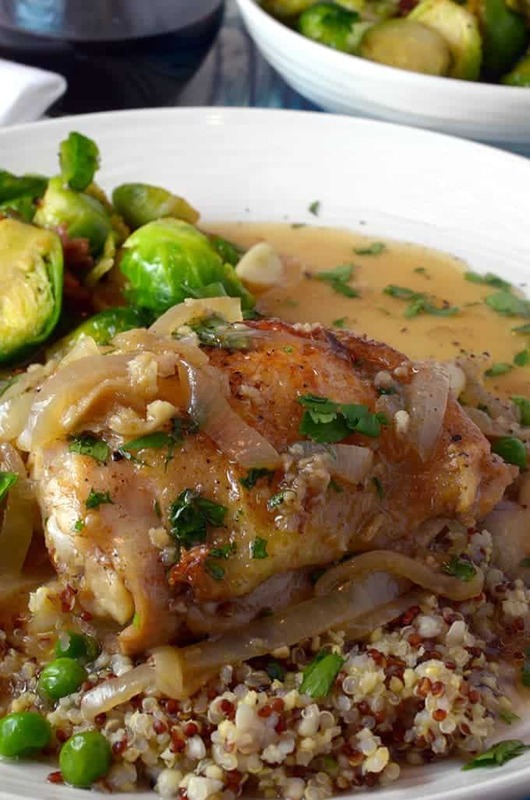 We served this whiskey chicken recipe with some seared Brussels sprouts, fortified with a little garlic and pancetta, all on a bed of quinoa that was soaked in sauce from the pan. 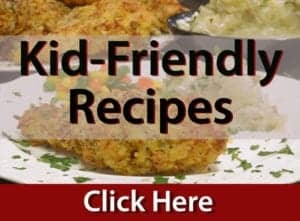 3 lbs bone-in chicken thighs with skin on. Use paper towels to pat dry the chicken thighs and then season with salt and pepper. Add 2 tablespoons butter and olive oil to large skillet and heat on medium high stove top. 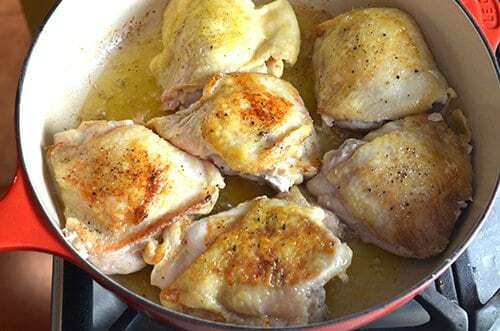 When butter and oil are hot, place chicken thighs in skillet, skin side down and sear for 10 minutes. Flip pieces and sear for 2 more minutes then remove from skillet and set aside. 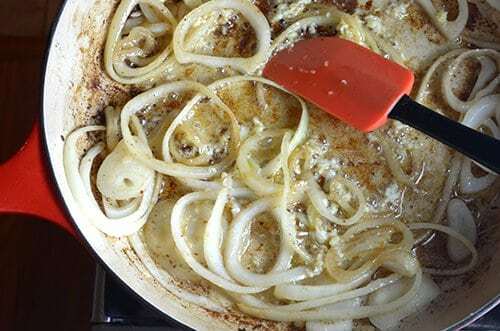 Add remaining butter to skillet and over medium add onions and stir for about 5 minutes until softened. Add garlic and stir and sauté for another minute. Next, add broth and bourbon and simmer for 5 minutes and then add chicken back to skillet, skin side up. Simmer for another 25 minutes or until chicken is cooked through and sauce begins to thicken. Add peas at the end, allow to simmer another minute or so and then garnish with parsley immediately before serving. I love quick dinners that turn out looking amazing! 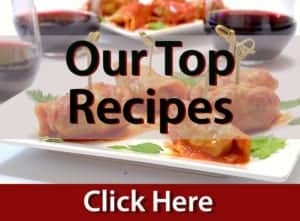 Is there a suitable alcohol free substitute for whisky? Oh that sounds AMAZING! I do love a good whisky, and this sounds like just the sort of meal I would really enjoy. 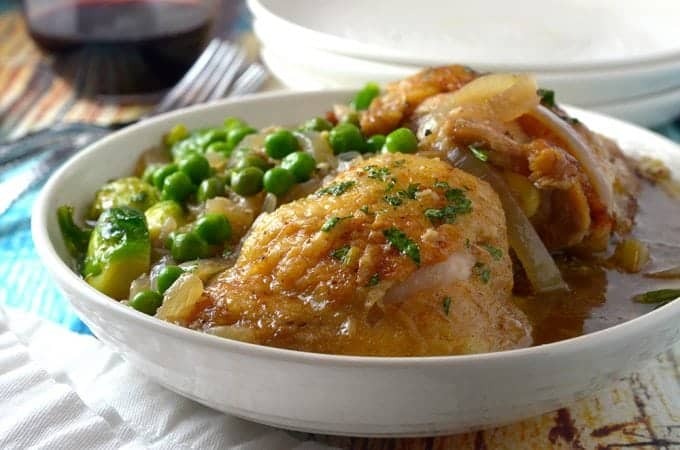 Totally a chicken dish full of great flavors! 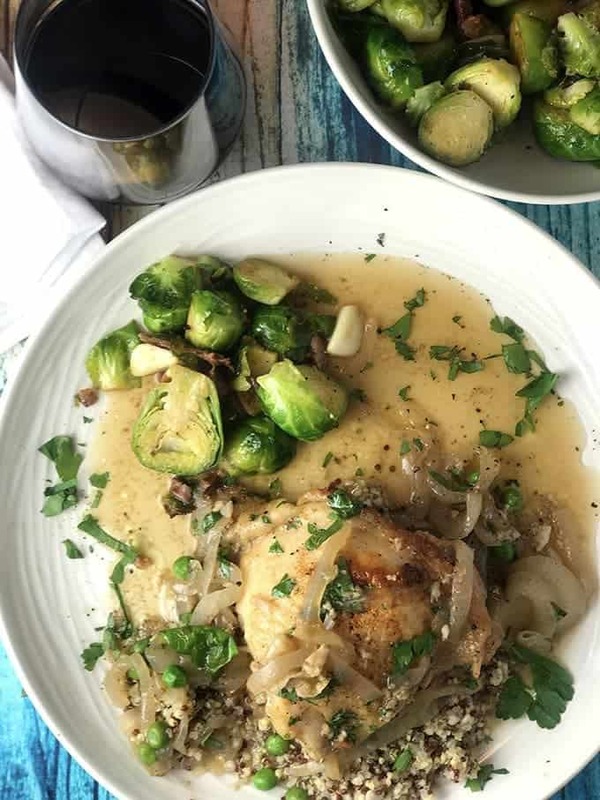 This dish is gorgeous, and so-so spring! Looks SO good! 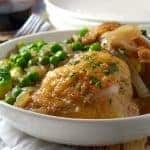 I bet the bourbon gives this dish a really complex flavor, and I love the addition of the peas to lighten things up!